As you can see the elasticity is shot. 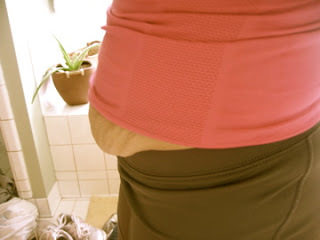 I wanted to show you the area where my belly pops out from under my workout top. This happens during class and drives me mad!!! And the last bottom image is me from the front. I just feel like my stomach does not match the rest of my body. Not to get all down on my body. I actually love my body! A little enhancement in the middle region would be the icing on the cake though! You look great - you really can't do anything with that skin except get it chopped off. You are gonna look fabulous. You look great (I know YOU notice your tummy, but I don't think other people can notice AT ALL). Nice arms! See ya in total body. 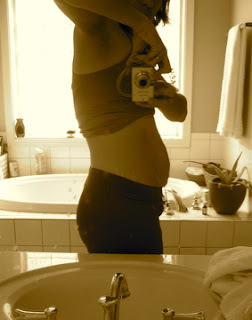 I never would have noticed your tummy in those work out clothes, but I know how you feel since you know it's there. I can't wait to see the after photos!